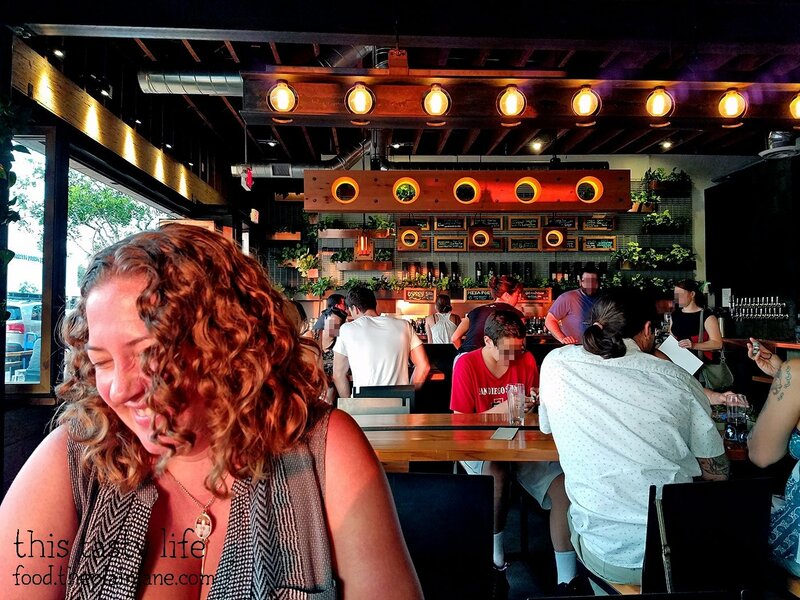 Recently I was invited to check out a new spot called Encontro North Park. Encontro is located where Heaven Sent Desserts used to be, on the corner of 30th and University in the heart of North Park. At Encontro, you place your order here and then find a little spot for yourself to sit at. They’ll bring the food out to you after you order! 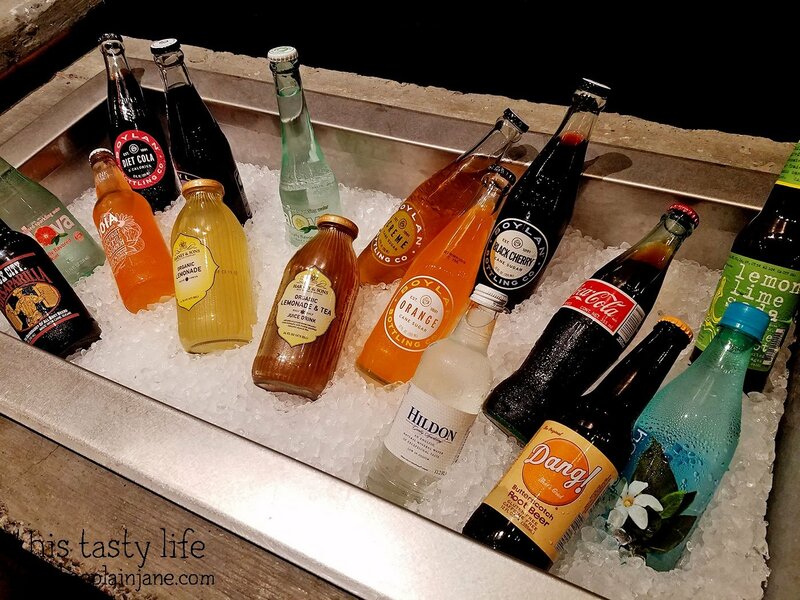 Encontro has alcoholic options at the bar in the back, but if you’re not feeling it then you can always choose one of these fancy craft beverages. Stacey was my date that evening. 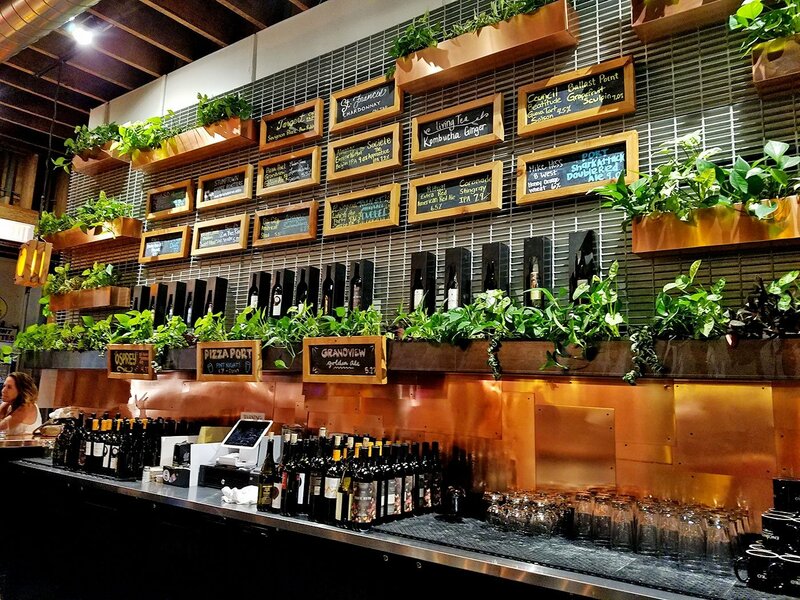 Here’s a closeup of their neat looking bar which has greenery all around it! When Stacey and I visited they were having a Pizza Port Brewing night. Here’s the menu at Encontro. They had a number of different entrees and salads available. 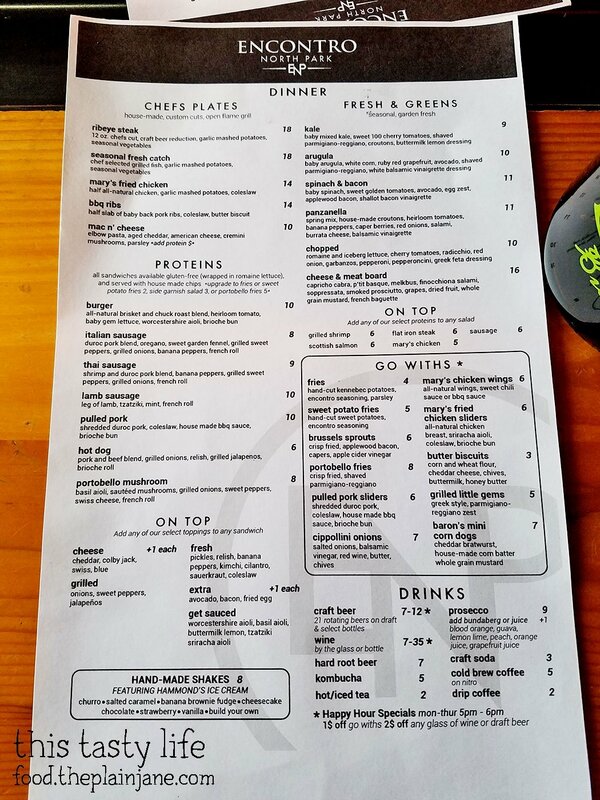 Since Stacey and I were sharing we decided to try out a few of the “Go Withs” so we could sample more stuff from their menu. I tried one of those fancy craft beverages. 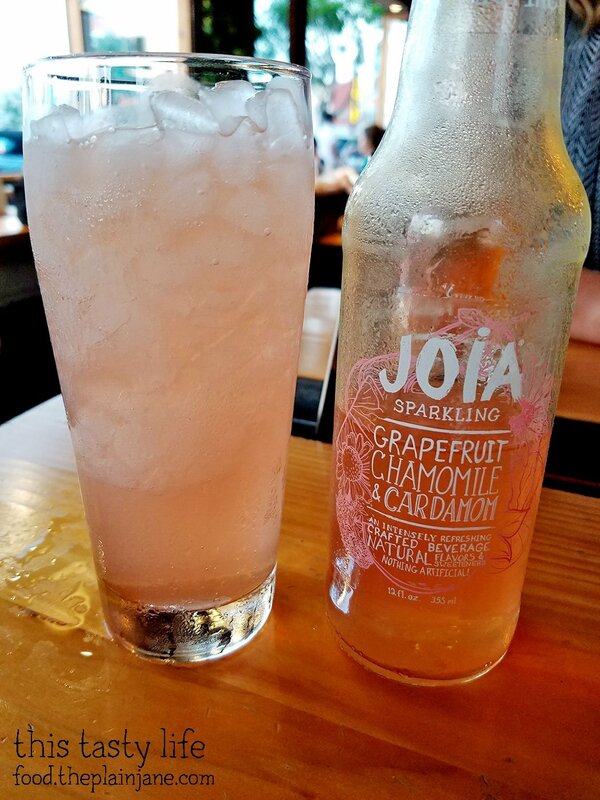 This Grapefruit Chamomile & Cardamom soda was definitely unlike anything else I had tried before. It wasn’t overly sweet and you could taste notes of all of the flavors mixed into the drink. I wouldn’t say this is something I’d crave again, but it was a nice change from the norm. 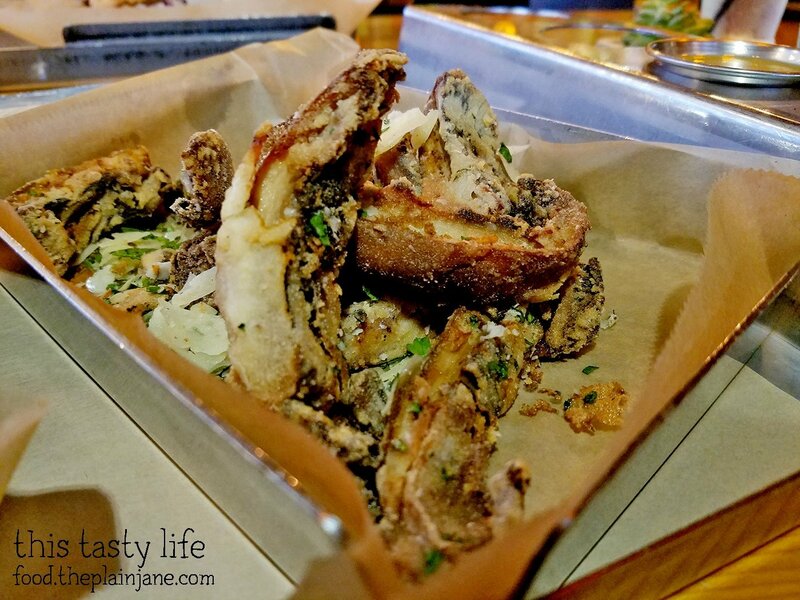 If you’re a mushroom lover like Stacey and I are, then you absolutely 100% must order these portobello fries. They cut up the portobello mushrooms into strips and fry these babies until they’re crispy. There’s a really light coating on them (maybe tempura?) and it’s sprinkled with Parmesan cheese and herbs. The portobello was a little crispy but still a little tender on the inside and filled with luscious mushroom goodness. I couldn’t get over how amazing these fries were! The texture and the flavor were superb and I’d honestly come back just to eat like, 2 more orders of these crazy good fries. Yum! My eyes lit up when I saw “butter biscuits” on the menu so it was an easy thing to add to our meal that night. 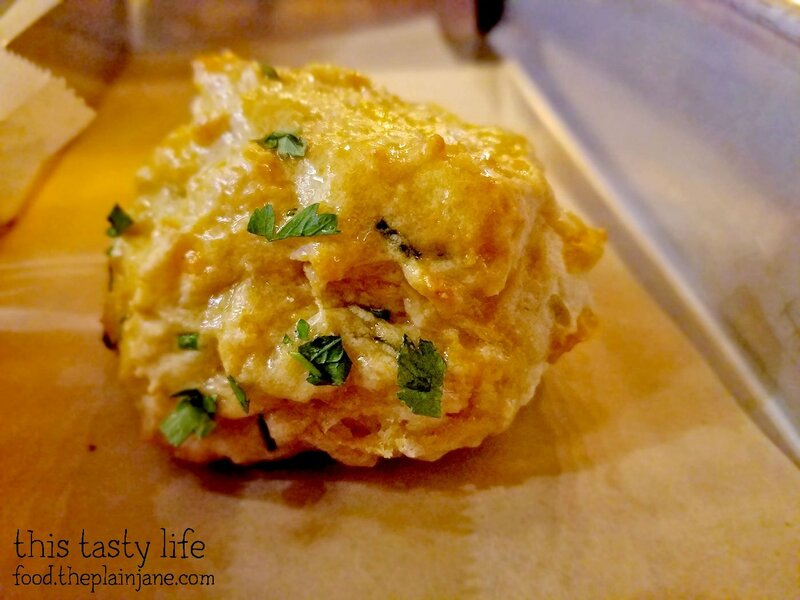 The biscuits are made with cheddar cheese, chives, and buttermilk and then topped with honey butter. Doesn’t it look like the biscuits are glistening? Oh you glorious biscuit! The biscuits are “normal” sized – not too small nor too large. The honey butter seems to cover every nook and cranny and gives a nice sweet flavor to the crunchy biscuits. 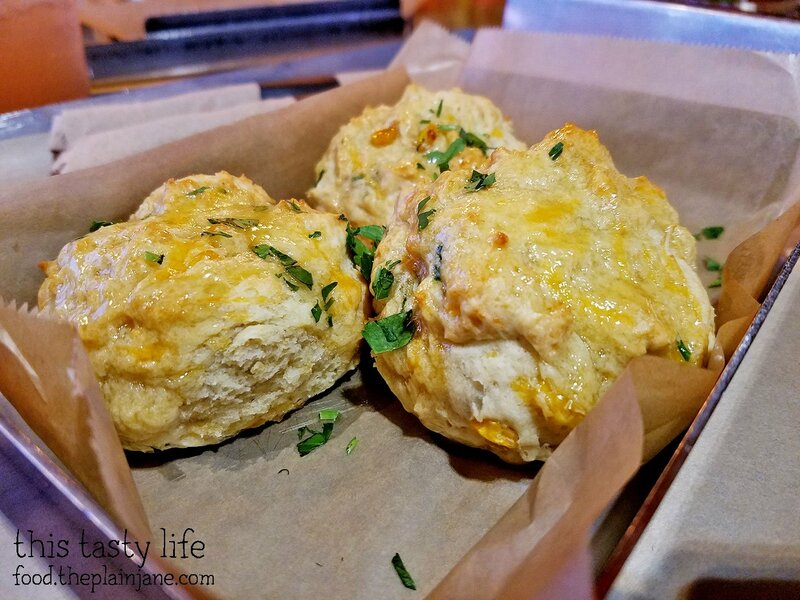 They even give you a side of butter to dip your biscuits into in case you don’t get enough…. that’s love and commitment right there. Stacey and I decided to try out the sliders. That way we wouldn’t have to bother cutting anything in half – they’re already be sharing size! Tiny little buns like this make me happy for some reason. They’re cute and cuddly! 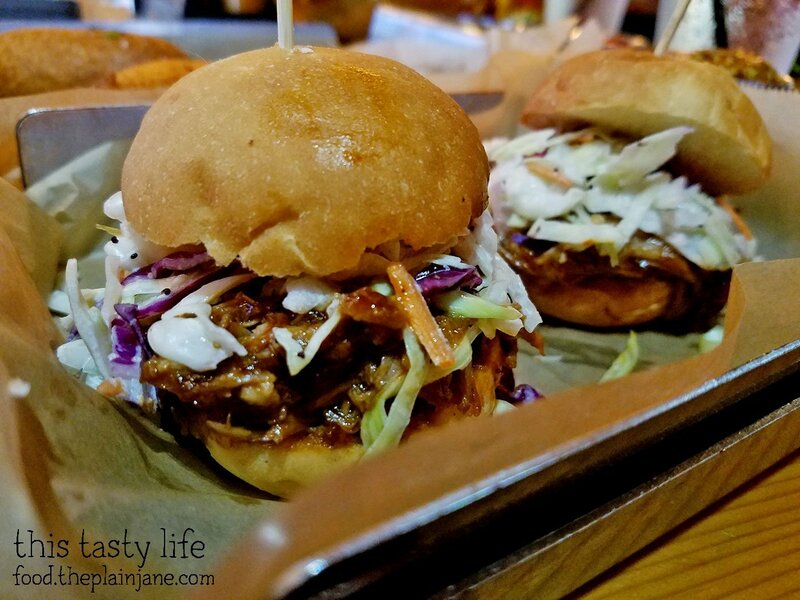 The pulled pork had a nice BBQ sauce on it but the coleslaw kind of killed it for me. Admittedly I’m not a fan of coleslaw but I like to try things the way they’re “meant to be” (unless it has pickles on it – sorry). This was a fair slider. Nothing outstanding but a decent bite. 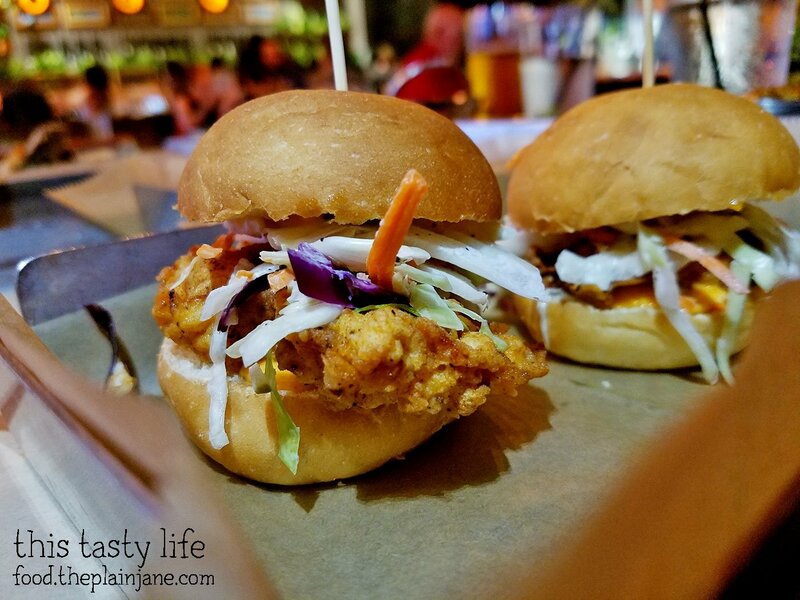 We also chose the fried chicken sliders which also had the coleslaw on them. The chicken itself was fine though maybe a tad on the drier side. 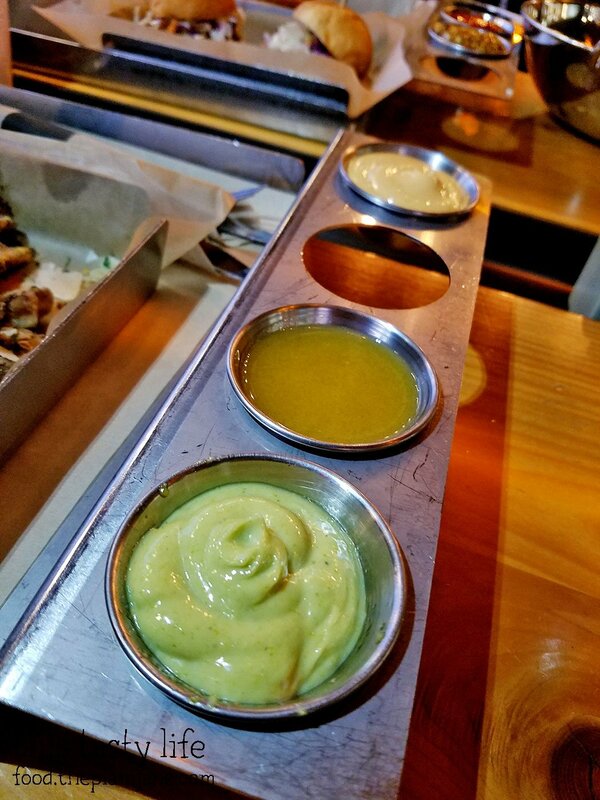 We got a whole slew of sauces with our food that came out in this cute little sauce holding tray! 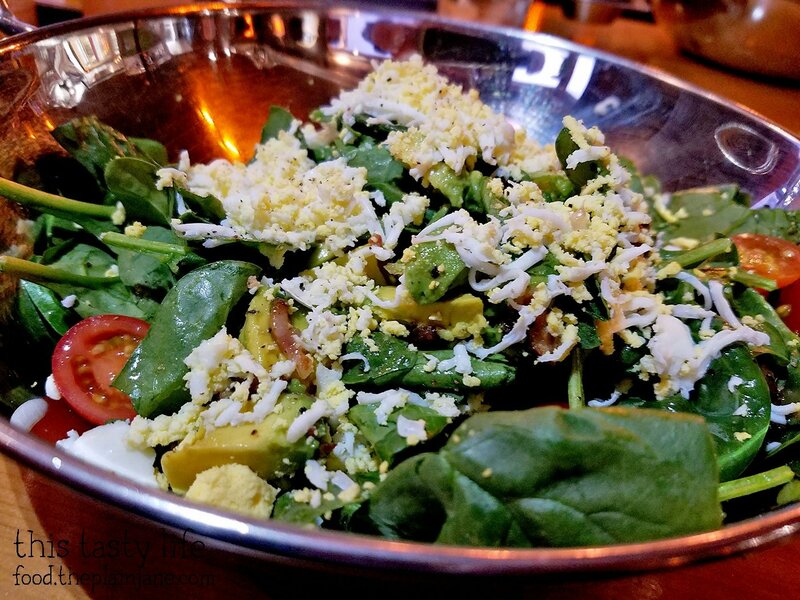 Stacey and I were really curious what “egg zest” was which was probably the real reason why we ordered this salad to share. It’s got baby spinach, golden tomatoes, avocado, egg zest, applewood bacon, and shallot bacon vinaigrette in it. Egg zest is basically a hard boiled egg that’s been zested with a microplane over the salad. It makes for fine little egg crumbs on top of the salad which we enjoyed. This was a really nice combination of flavors and it almost reminded me a bit of a chef salad. I love baby spinach as a replacement for lettuce! 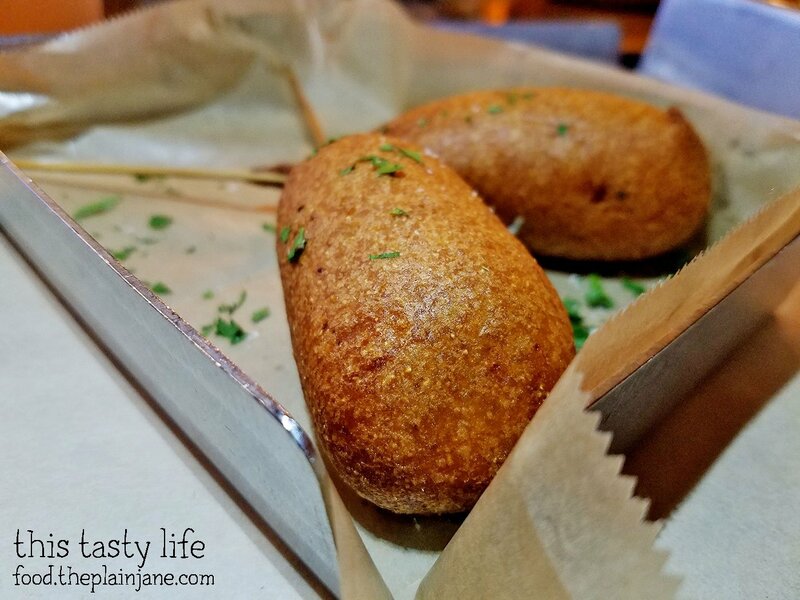 Our last “real food” item that we ordered were the mini corn dogs which are stuffed with cheddar bratwurst and covered in a house made corn batter. I really ordered these because of the cheddar bratwurst tucked inside! These were the perfect little portion of mini corn dog. The cheddar brat inside was hot, juicy, and had a nice amount of cheese tucked into it. The corn batter was crunchy and a little thick. It had a little bit of a cornmeal texture which I really liked. I thought these were excellent and would happily eat them again. At Encontro their dessert offerings involve milkshakes! Sure, we could have shared one but where’s the fun in that?! Stacey got the Banana Brownie Fudge milkshake. It had large chunks of brownie in it which were not straw friendly – you definitely needed a spoon to scoop those brownie pieces into your mouth! 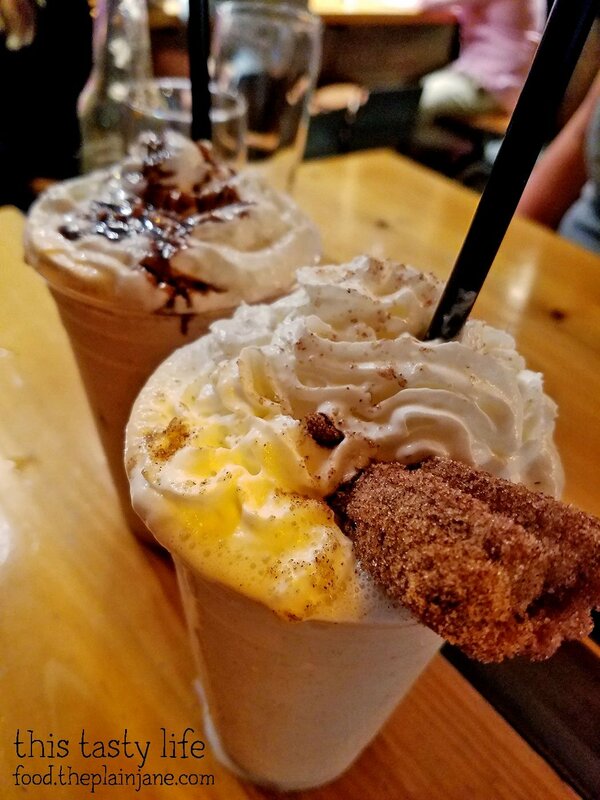 I went for the Churro Milkshake. It looks like the churro is small from this photo, but actually half of the churro is hidden and tucked into that mound of whipped cream on top. 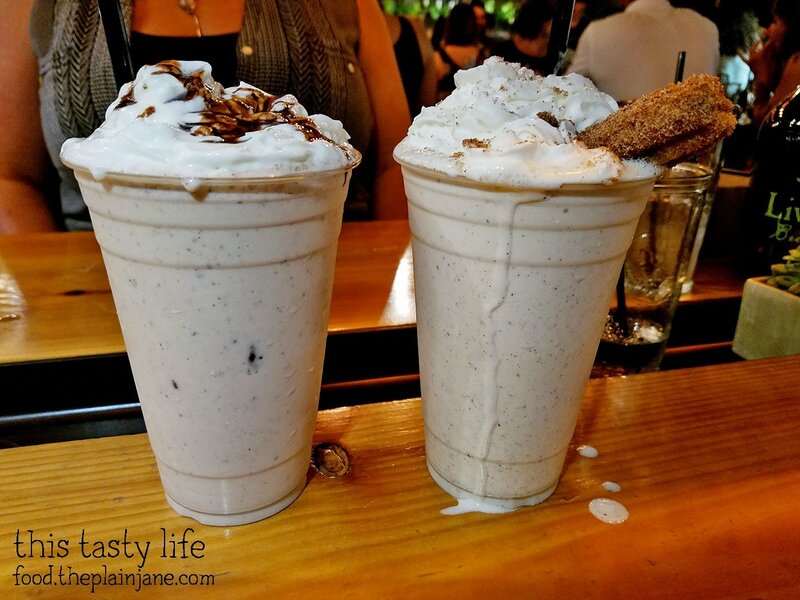 The churro is served warm with the cool, creamy, cinnamony milkshake. While I did enjoy the shake, I probably could have just eaten the churro alone and been happy. It’s a lot of milkshake for one person! It’s yummy though and great on a warm summer day. While I didn’t quite love all of the food here, I can say I’d come back for a few of the things (hello portobello fries and mini corn dogs!!) and would totally like to try some of the actual entrees that are available. Encontro has a cool, laid back vibe. There’s outdoor seating available making it dog friendly and a lovely place to have a meal and a drink. 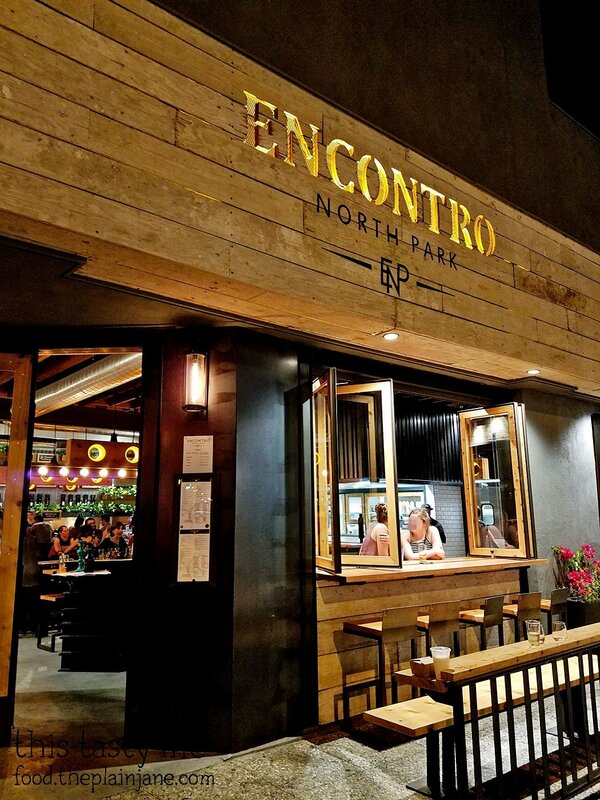 Disclaimer: I was invited to dine at Encontro North Park. Our meal was complimentary. I was not further compensated for this post and all opinions here are my own. We went here out of curiosity earlier this year when they opened. We liked their shrimp and Duroc pork sandwich with sweet potato fries along with their portobello fries. I didn’t expect the mushroom fries to taste so good. The coating was really thin but crisp. I still remember when it was Heaven Sent way back when. I’d go back to try those biscuits that you had! Hi CC – Funny, I didn’t expect the mushroom fries to be that good either! It’s actually made me crave mushrooms more since I’ve had it – they were so freaking good! Definitely try the biscuits – they were really yummy. 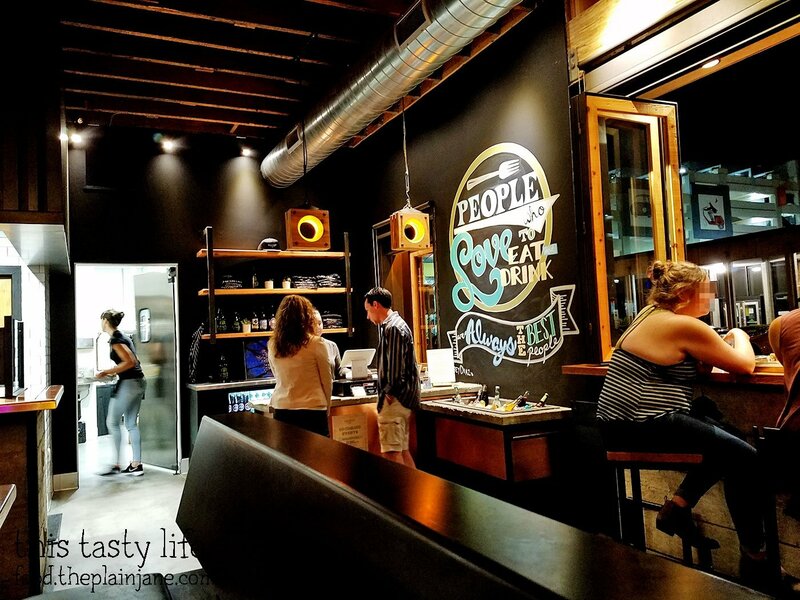 We will, I’m thinking of of doing a North Park food crawl with some GF’s. Biscuits for sure! 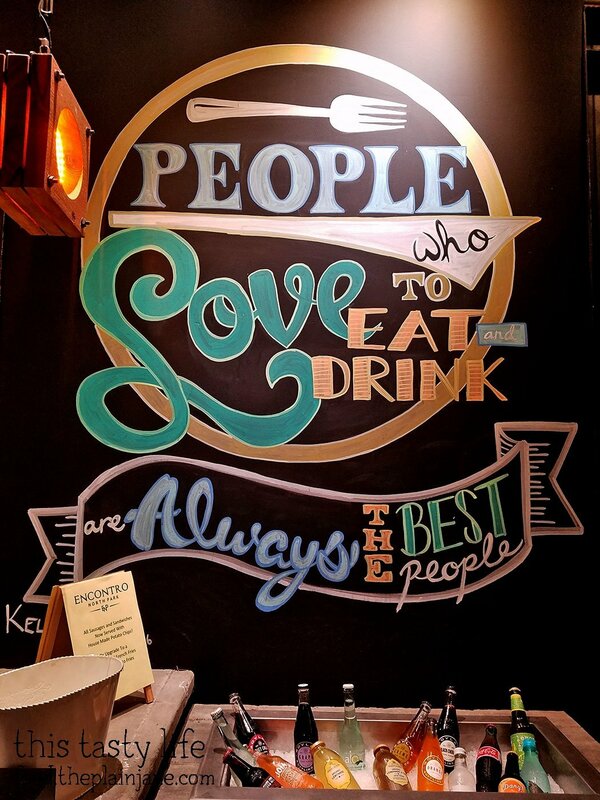 And probably those mushroom fries again!